Will fit the three 2-inch-square gourd rack poles we offer (SV8, DGR12, AAA-16). 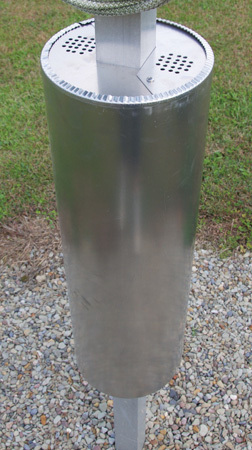 This aluminum pole guard is 24" long with a 7-1/2" diameter tube. The top plate features "snake sniffer" holes. Snakes climb poles entering inside the tube and become confused as they can't get thru the holes. Will prevent snakes, raccoons, cats, squirrels, and opossums from climbing your 2”-inch square poles and predating your martins when mounted at the proper height. Does not require removal prior to conducting a nest check because it is mounted below the lanyard cleat.